When she realizes that I remember, a big smile appears on her face and she beams with joy. I quickly give her a hug and kissed her cheek. She immediately passes the baby over to me. I bask in the beauty of Gods creation. The time spent with the women and their families is holy. The mission of Breath of Life is not only to provide maternal and neonatal health, but also offer them a breath of life spiritually. By walking with them during one of the most monumental times in their life (birthing life into the world) and meeting some of their physical needs, we have the opportunity to share the love of Christ and God’s Word. It’s about investing in relationships. As a missionary, there are moments of great joy and reward. However, it’s not always glorious. There are often deep feelings of defeat and heartache. Loving the oppressed and brokenhearted is hard and takes grit. I never knew my heart could love and hurt so much. I’m humbled He allows me to love the broken and oppressed. I stepped on Haitian soil almost 5 years ago. Never in my wildest dreams would have imagined I would completely fall in love. In Mathew 28:19, Jesus commanded us to “go therefore and make disciples of all the nations”. For some of us it may be serving and sharing the gospel in a foreign country or within the United States. For others, it may be financially supporting missionaries. Either way, we are all called to missions and outreach. 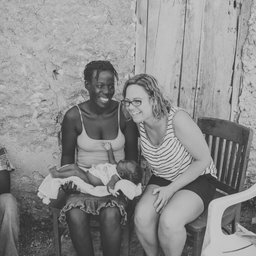 For me, I truly believe God has called me to love, encourage and walk alongside the women and families in Dèsarmes, Haiti. Over the course of two years we have made great strides. As the ministry continues to bear fruit, it also demands more time. In order for a “good thing” to continue flourishing, it needs to be nurtured. The board of directors recently decided for the growth of the organization, it is instrumental that a missionary/leader position be created in order to assure continued growth. When God gave me the vision for Breath of Life almost three years ago, I never would have imagined it would grow so quickly. Throughout the years I have not received any financial support. I never intended or had any predictions of needing it. However, the organization is demanding more time, energy and passion. The board would like to begin making the transition into me serving full-time as soon as possible. I am confident that the organization will flourish beyond our wildest dreams. God has already opened up huge doors of opportunity. This past spring, I started taking courses to become a Certified Professional Midwife (CPM). As a CPM, I will be able to better serve the women and their families. Our desire is to continue strengthening relationships with the women and their families. However, it is often difficult to have intimate conversations with the language barrier. Starting in July, I will begin taking a Haitian creole language course to better learn their native tongue. I will still continue to oversee the operation of projects, lead vision teams on the ground, build partnerships, spread awareness and fundraise. With me having the ability to focus much more of my attention on leading the organization, we will better be able to meet the needs of the women and families much better. In order for us to make the transition, we are seeking monthly partnerships from individuals, businesses and churches. We have a goal to raise at least $2,000 a month. This will better position Breath of Life Haiti to breath hope and life into the women and families in Dèsarmes, Haiti.